SafetyTac 2.0 with Armor Technology The industry leading floor tape that holds up to anything! SafetyTac® 2.0 is designed with ARMOR technology to withstand the toughest industrial conditions. The harder, denser material used in SafetyTac® 2.0 allows it to hold up to intense traffic, and the tape has advanced pivot resistance so forklifts and other equipment can turn directly on the tape without causing damage. Triple-stage tapered edges make it possible for heavy machinery to easily slide over the tape, and it won’t shatter, even when a heavy object is dropped on it. Like standard SafetyTac® tape, SafetyTac® 2.0 is also resistant to wet conditions and chemical spills. The advanced tapered edging of this tape allows even the heaviest materials to move freely over your floor markings. SafetyTac®'s low profile allows it to sit smoothly on your floors, so it will not create a tripping hazard. Despite being made from a dense material, this tape is engineered not to shatter even if heavy objects are dropped on it. This tape's flexible and resilient material prevents damage when heavy equipment turns or pivots on it. 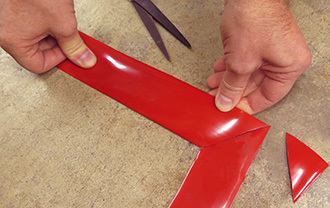 Applying SafetyTac® tape to the floor is simple. Remove the backing, lay the tape on the floor, and press it down. No dry time required.